It was as easy to become dizzy watching Adam Theis perform as part of The Soiled Dove extravaganza in Uptown Oakland last month as it was witnessing the production’s aerialists and acrobats do their magical thing. In his role with the throwback alternative circus that is hosted by the Vau de Vivre Society, the multi-instrumentalist led two separate bands — one for the dinner show and another for the production itself — while acting, switching between trombone and bass guitar, and even riding a skateboard momentarily. Jazz Mafia, led by Adam Theis, performed Miles Davis' Birth Of the Cool at The SFJAZZ Center on Friday night. The sold-out crowd was treated to an hour of this "musical experiment" masterpiece that was made in the '40s and '50s by jazz greats like Miles Davis, Gil Evans, Gerry Mulligan, and John Lewis. Acrobatics, corsetry and mustaches, oh my! San Francisco's newest dinner theater is busting out the big acts for patrons who like a good spectacle. 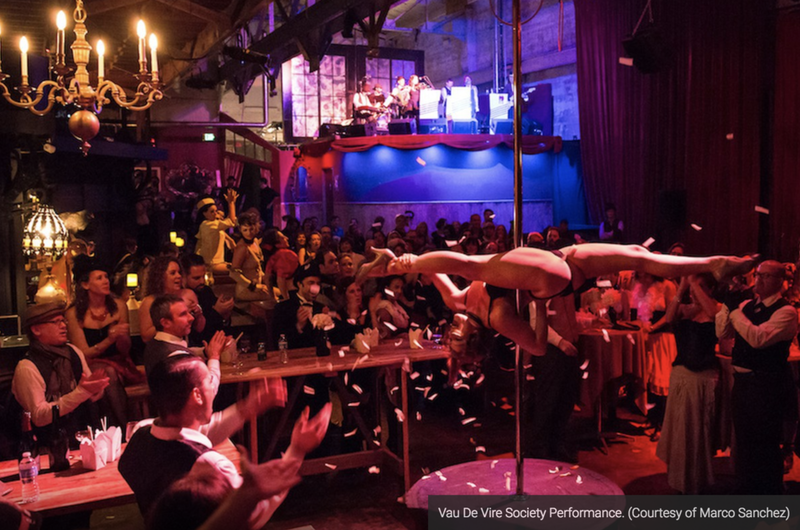 The Soiled Dove, presented by the Vau de Vire Society of The Edwardian Ball and New Bohemia NYE, bills itself as "an immersive, circus-infused dinner theater set in San Francisco's notorious Barbary Coast red light district." And immersive it is with gravity-defying acts that take place among and above the audience accompanied by stage performances and live music from Jazz Mafia and Realistic Orchestra. The dinner show is on its second run in San Francisco after multiple sold-out performances in December; it runs through April 4. Get a sneak preview in the photos above. 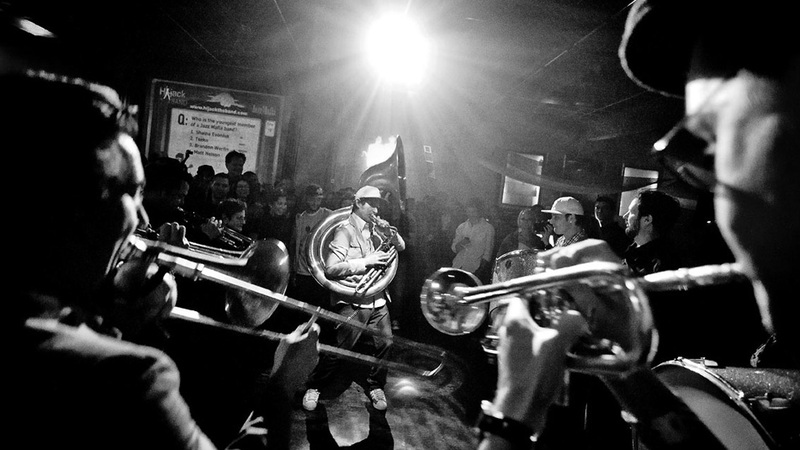 The Realistic Orchestra plays live in collaboration with visual artist Joe Caseand aerialist Amanda Boggs at the premiere of the Treat Street Social Clubon March 27, 2012. Adam Theis is the Jazz Mafia guy, always a little bit different. Watch him on YouTube wailing on his trombone — while wake surfing on Lake Sonoma. Or directing his band Supertaster, while backing Stevie Wonder in a packed San Francisco lounge. And then marshaling his troops onstage at the Palace of Fine Arts Theatre: 55 rappers, singers and instrumentalists, performing one of his hip-hop symphonies. Check out this video montage of the Jazz Mafia celebrating their 12 Year Anniversary with a kickin’ live show at the historic Fillmore in San Francisco on November 18, 2012. It was such an epic show! 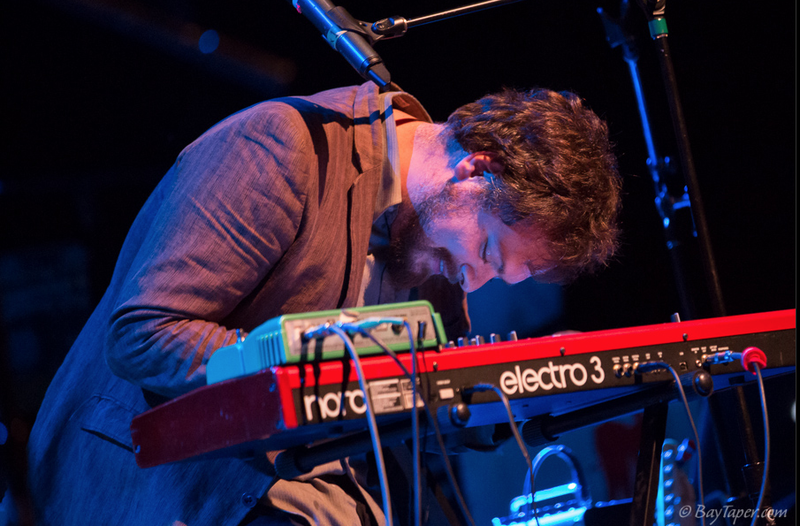 Photographs from the first show of the Jazz Mafia’s multi-night run of their Symphony No. 2 “Emperor Norton Suite” live at Yoshi’s San Francisco on November 3, 2011. The last time Roy Ayers was in town, he stood on a smallish stage alongside his band of brothers in musical arms, filling the room with the energy and sound of double the troops that were camped out underneath the lights. At Central Park SummerStage, these imaginary figures were realized as actual people, about 30 or so comprising San Francisco’s Jazz Mafia Symphony, which had been commissioned to augment Ayers’ classics in celebration of his 70th birthday last year. From the position at back left on the ground’s green astro turf, the Brooklyn native was a tiny blip amongst the mass of people—full percussion, brass, string and vocal sections—but as always, he raged away, this time with a pair of red-headed vibraphone mallets. If a philharmonic orchestra married a big band and kept its street rap mistress in the attic, you’d have something approaching the Jazz Mafia sound. And one hell of a dysfunctional family dynamic. 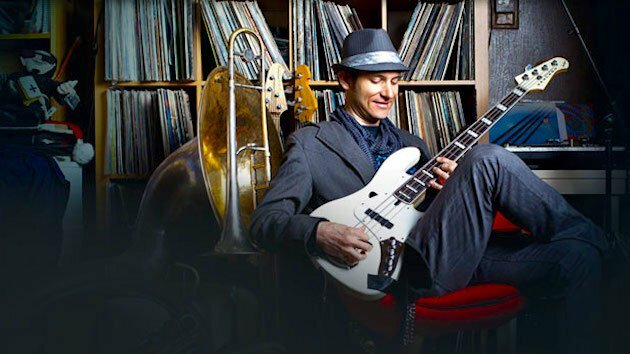 Playing Stern Grove this weekend, Jazz Mafia's electric blend of funk, soul, and brass will continue to defy genre with all its funky brass heart. 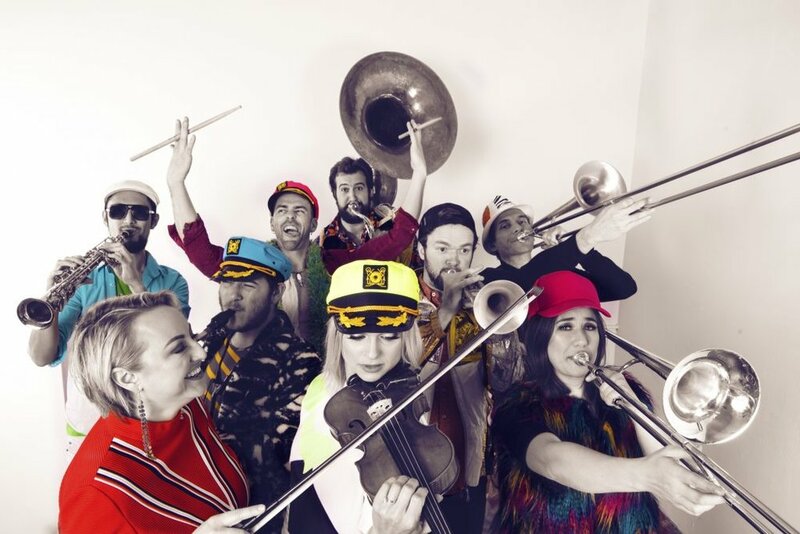 Best known for its hip-hop symphony Brass, Bows, and Beats, the Mission-based music collective is premiering a new piece, Emperor Norton Symphony No. 2. An eccentrically excellent fusion of sound in honor of the eccentrically excellent San Franciscan who claimed imperial sovereignty in 1859 and lived out the rest of his life being humored by local bartenders who accepted his currency, drawn with what we assume was the 19th century's answer to the crayon. Jazz Mafia will perform with guest star Chali 2na (who’s also shared the stage with Ozomatli and Jurassic 5). 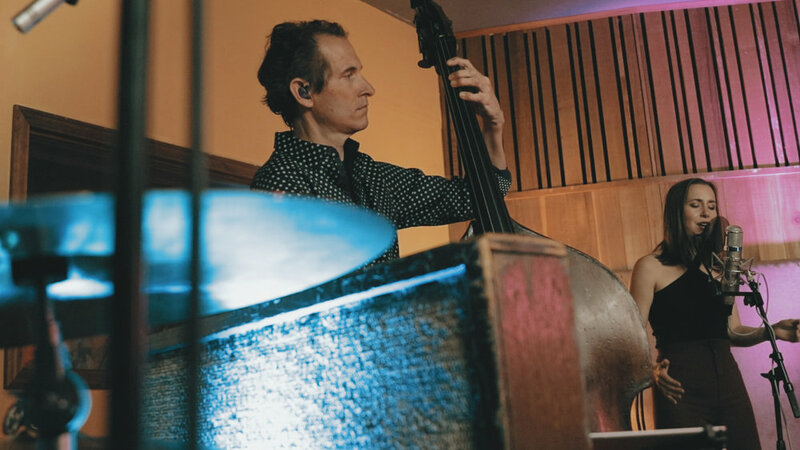 California producer Amp Live teamed up with Bay Area collective Jazz Mafia to craft appropriately eerie remixes of "Yonkers", "Radicals", and "Goblin" from the much-discussed Tyler, the Creatorsolo full-length. After many hours of work putting this together, I’m very excited to release this stellar nine-minute multimedia piece of the always amazing Realistic Orchestra performing their killin’ track SR 75 live at the Coda Lounge in San Francisco’s Mission District on February 9, 2010.